This workshop will explore the wonderful world of watercolor! Students will learn from many demos and hands-on activities about color choices, watercolor glazing, and resists. Within the four hour workshop, students will be able to create three or four masterpieces. Our subject matter will very from landscapes, floral still life, people, animals, buildings, and more! 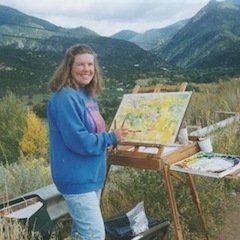 Join us for this exciting watercolor workshop and learn from one of Denver’s most talented watercolorists!